5micron GmbH is a young company located in the innovation & technology hub in Berlin-Adlershof since January 2015. Stakeholder and Managing Directors are Dipl. Ing. Ute Franke and Dr. Jean Blondeau. The company was founded with the business idea 'Development of optical measurement systems for highest precise topographic analyses of surfaces and surface close layers'. The company started with 2 contracted projects from Airbus and Rolls-Royce. 5micron‘s portfolio is based upon photonics technology for high-precision measurement systems. The successfully completed technology development projects for the aerospace industry are based on optic methods, using light for measurement tasks. Current projects are the monitoring and measurement of wing surfaces of aircrafts during flight. The measurement system detects defects or variations in the surface up to 20µm. For further projects the measurement systems have been miniaturized to fit in an endoscope for engine maintenance purposes. In this context specialized illumination devices as a light communicating system for drones identification or other objects have been developed. This light communication system is operating with modulated flashes transmitting covert data or any other information. Dipl.-Ing. Ute Franke Co-Founder & Enabler Ute Franke has more than 15 years experience in the field of project management, sales and business development mainly for the aviation industry. It had its start at the Brandenburg airship developer Cargo Lifter AG in Brand. In 2002 she changed to the aerospace supplier FTI Engineering Network GmbH in Berlin and Brandenburg. 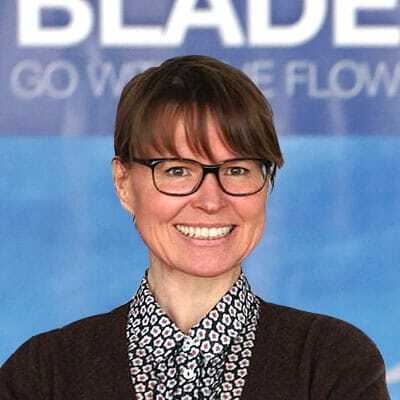 She gained experience and comprehensive expertise in business developement due to different roles as sales engineer, head of the project office and key account manager for Rolls-Royce Deutschland and Embraer. In 2009 she took over the business unit ‚New Technology‘ and realized several national and international research and development projects in the aerospace sector. In 2015 she has founded the company 5micron GmbH together with Dr. Jean Blondeau. Dr. Jean Blondeau Co-Founder & Inventor Jean Blondeau has received his PhD in biological Cybernetic in Tübingen, Germany. He has been working free-lance for 10 years in management for industrial processes and measurement in Würzburg. 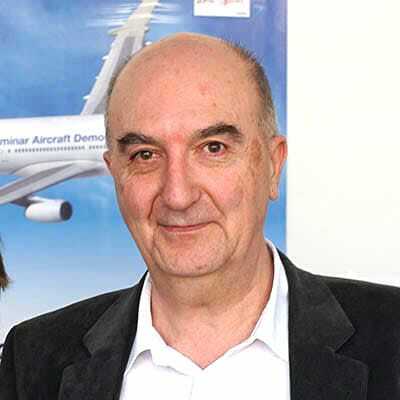 He joined the management board of Metronom GmbH until 2001 as the technical director. His measurement methods have been successfully applied in railway, automotive and aerospace industries. 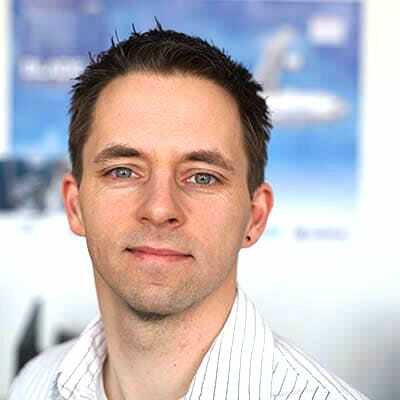 Almost for one decade he then has joined the aerospace supplier FTI Engineering Network GmbH, first in Bremen for the customer Airbus and later on in Brandenburg. In 2015 he has founded the company 5micron GmbH together with Ute Franke. We at 5micron are doing topographic measurements where most people do not reach. Minute disturbances up to 5 micrometer is the range we can achieve for surface measurements on a wide range of materials. Our Software algorithms are analysing image data no matter if micro or macro or camera pictures or thermographic images and can as well provide added value to existing data. The 5micron team is looking for technical developers to support the creation of non-standard measurement solutions. You will be member of a team rapidly developing methods and measurement solutions, primarily in the optical measurement context. In this team we will trial new approaches, new techniques, new technologies, and will assess the capability as a product, sometimes in competition to a colleagues technical approach. New solution approaches will be instantly realized (function model as a result of a feasibility study) to assess the methodology. The next step is then a more detailed demonstrator and beta products. Our solutions are focussed around aerospace, automotive and have been transferred to the film industry, too. You are passionate about the interaction between optics and computer hardware as well as with image recognition programming and algorithms. You can demonstrate how these can be employed to develop innovative measurement devices. In this role, you will develop new measurement technologies based on standard physical methods as deflectometry or light section. You will experiment with optical benches and various camera chips, working with state of the art tools as MS office for documentation and will code in MatLab, C++, C# or python. Must have a degree or relevant demonstrable experience in Computing, Mathematics, Engineering, Physics, Biology, or other science related field. Working knowledge is preferred. Skilled at project management and presentation. The 5micron team is looking for Software Developers to support the creation of non-standard measurement solutions. You will be member of a team rapidly developing methods and measurement solutions, primarily in the optical measurement context. In this team we will trial new approaches, new techniques, new technologies, and will assess the capability as a product, sometimes in competition to a colleagues technical approach. New solution approaches will be instantly realized (function model as a result of a feasibility study) to assess the methodology. The next step is to make a more detailed demonstrator and beta products. Our solutions are focussed around aerospace and automotive and have been transferred to the film industry, too. measurement devices. In this role, you will experiment with the team on optical benches and may program Raspberry Pi's or Arduinos. Coding in MatLab, C++, C# or python as well working with state of the art tools as MS office for documentation is what you are best in. Das 5micron Team sucht ein Multitalent für die Verstärkung im Prototypenbau. Das Aufgabenspektrum umfasst vom mechanischen Design und Zusammenbau von Fertigkomponenten, die Bestellung und Materialverwaltung, aber auch Aufgaben aus dem analogen oder digitalen Elektronikbereich wie Löten, oder auch das Bestückung einer Platine. Sie werden Teil eines kleinen, kreativen Entwickler Teams sein mit eigener Verantwortung für unsere ‚Laborwerkstatt‘. Sie sind ein Pfiffikus, leidenschaftlicher Tüftler, bei gleichzeitigem Anspruch sauber, hochwertig und konzentriert zu arbeiten. Kleinere Testaufbauten, die dem Entwicklungsteam als Machbarkeits – oder Funktionsüberprüfung dienen, können sie Ideenreich und schnell umsetzen. Sie haben keine Hemmungen Dinge anzupacken oder lassen sich von Überraschungen oder Fehlschlägen nicht abschrecken. Sie kennen sich mit MS Office für Dokumentationszwecke aus und können den Aufbau als technische Zeichnung dokumentieren. Do you want to gain practical experience and be part of a small powerful development team in the heart of the technology hub in Berlin-Adlershof? We offer students from various disciplines and subjects an ideal surrounding to apply their talents and skills and find out where they are best in. 5micron GmbH is a young company in the optical measurements branch. In the last 3 years we have successfully developed and implemented amazing meaningful measurement devices mainly in the aerospace industry as for Airbus or Rolls-Royce. The nature of our projects is image analysis. We deliver topographic or other data about surfaces e.g. of aircraft wings during flight. The 5micron team are looking for students to support the creation of non-standard measurement solutions. 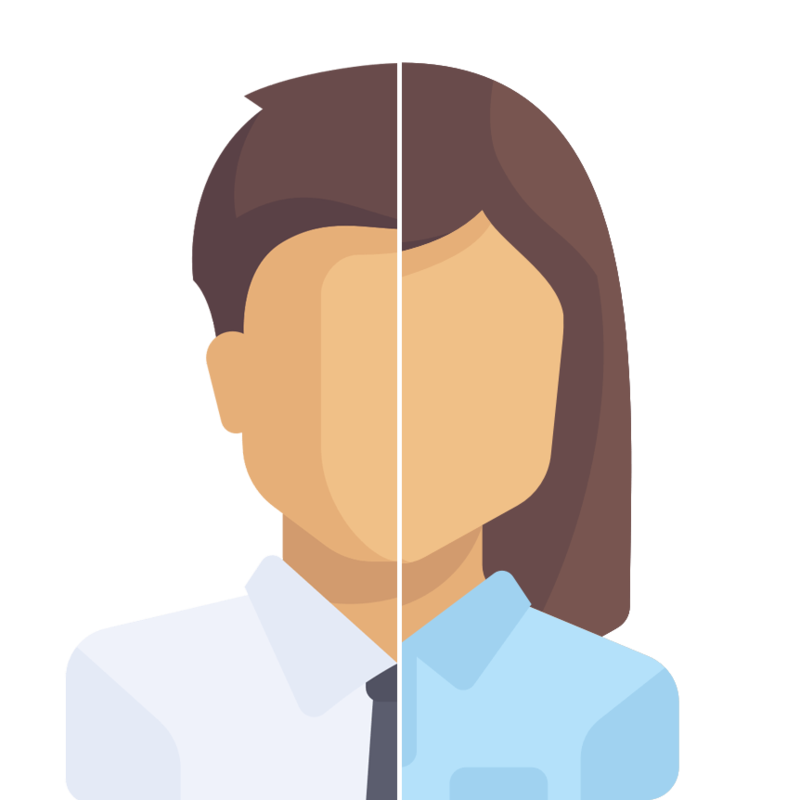 Either if you just want to work part time or are looking for a bachelor or master thesis – we are proud on our measurement solutions and ideas and would like to share and discuss them with you in a team to reach even further with our technology. You will be member of a team rapidly developing methods and measurement solutions, primarily in the optical measurement context. In this team we will tackle new approaches, new techniques, new technologies, and will assess the capability as a product, sometimes in competition to a colleagues technical approach. New solution approaches will be instantly realized (function model as a result of a feasibility study) to assess the methodology. The next step is then a more detailed demonstrator and beta products. Our solutions are focused around aerospace and have been transferred to other areas as the film industry, too. You like technical challenges and have ideas how to solve them in a team. You are interested in transferring your ideas into code, running processes on CPU’S or GPU’s or experimenting with Raspberry Pi's or Arduinos. You are not shy if it comes to analogue or digital electronics to assemble a function model to test if the idea will work. Ideally you are already experienced with image recognition programming and algorithms. Our tool kit is MatLab, C++, C# or python. You are good in documentation with state of the art tools as MS office word or excel. Working in a young company with no classical management hierarchies, multi oriented and talented colleagues (as communication engineer, bio-cybernaticist or physicist,..) is a unique opportunity to find out in which field you are best in. We have flexible working hours and a good atmosphere in a small team. If you find this interesting get in contact with us.